Recent travel changes will be noted here. Fixture list for 2014-15 see fixtures Contact Roy Eagles email Roy for social events before the match. 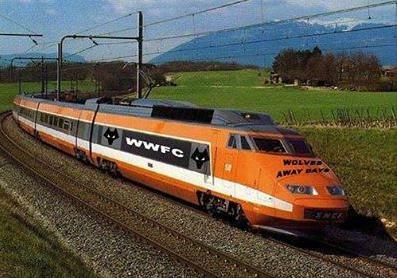 Members are reminded that while they are traveling, at the match, on the way, especially on the train, or even in the pub home or away they are seen to be representing both Wolves and London Wolves at all times, and are expected to behave appropriately. London Wolves support the Club’s campaign to cut out bad language in the family areas and expect that to be respected and will take action under rule 5 if it is not. Normal fares : Members £20 (Guests/non-members £25) Juniors £10 (junior guests £12.50) However Virgin are reducing the available reduced price tickets and not offering the full group deals hence prices may change, so book early. Note: Wolverhampton pre-match meeting place is now (2016) the Lych Gate Tavern (off Queen Square by St Peter’s Church Lych Gate/Barclays Bank) if specifically advised. Alternative Venue: the Lych Gate Tavern (off Queen Square by St Peter’s Church Lych Gate/Barclays Bank) if specifically advised. Reserve matches are generally at the Telford AFC or very occasionally Molineux . Home season tickets also give entry to home reserve matches. Any member wishing to book a train ticket for travel to home or away matches from Euston, must now contact the Travel Secretary AT LEAST 9 DAYS prior to a match. Bookings for travel with other train operators must be made 3-4 weeks before the match. This is because early booking is essential in order to obtain the cheapest tickets. Fares will be collected on the outward journey. Payments in advance are accepted. Cheques/P.O’s payable to WWLSC. Any member booking a train ticket, who subsequently cannot travel, must contact the Travel Secretary at least 9 days before a match to cancel, or they will have to pay for the ticket. This also applies to members who book a ticket and fail to show up on the day, as the train companies will not offer any refunds on unsold tickets, except in exceptional circumstances. Members requiring match tickets for HOME matches, please contact Travel Secretary AT LEAST 16 DAYS prior to a match. Please enclose s.a.e. with postal applications. Please note that for all-ticket away matches where Wolves allocation is limited, ONLY AWAY SEASON TICKET HOLDERS CAN BE GUARANTEED A TICKET. Tickets for every away match go on sale 21 days before the match to away season ticket holders and also to home season ticket holders, unless Wolves have a limited allocation. Home season ticket holders can apply for away tickets by ringing the Wolves Ticketline on 0871 222 1877 between 9am – 5pm, and giving their Supporter Number. There are 7 Club season tickets available to members on a match to match basis. Full match day price will be charged. Members must travel on the official Club trip for the particular game for which the ticket is required.
) whereby fans may be refused travel if drunk or if attempting to take alcohol on to a designated dry train). Members are expected to conform. Please note also that dates and times of matches are likely to be changed because of live TV coverage. BEWARE: Wolverhampton Council has also extended (from April 2014) parking restrictions to Bank Holidays and Sundays so meters are no longer free on those days and single yellow lines are active. Here is a map of Central Wolverhampton with car parks. 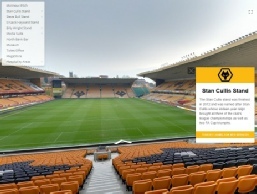 Molineux stadium is to the North West - off junction H on the ring road. Hotels - additional service for fans: A message from supporters’ accommodations- We have been in the hotel booking industry for several years and have been very successful. We built www.supportersaccommodation.com 2 years ago and through feedback found out that not all hotels welcomed football fans for one reason or another so we decided to get in contact with the hotels directly and find out if they do or not and the ones on our site do. The London Wolves former meeting place - the Bluebrick (see above) is next to the Wolverhampton Premier Inn details click here - booking early can often give good deals. 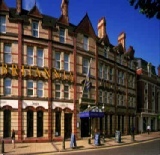 The Britannia (near the Station and Bus Station and 10 minutes walk from Molineux) is a favourite stay for Viking Wolves and used to offer London Wolves reduced rates. These are no longer available but they may still have a deal on for particular weekends. The Britannia has undergone substantial renovation and redecoration recently and is well situated for the Town Centre, Friday evening clubs and theatre, Saturday morning shopping and the Molineux. They can also offer deals for parties and use the station car park for parking. Telephone 01902 429922 mention London Wolves and ask for any discount! New Hotel Search & Booking Facility - Match Hotels - Match Hotels cover most of the English league clubs towns and cities. 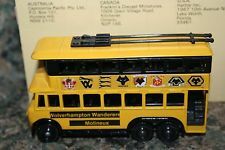 OLD SERVICE FROM LONDON WOLVES in conjunction with AWAYDAYS MAPS. Click on the dropdown for some away grounds. Unfortunately this is out-of date but if you put the postcode, ground name or town into the field on the right that should work. You’ll see the train station, pubs etc. The maps are still up to date although the service for booking appears to have been closed. Leave Watford Junction station & take main road straight opposite (Clarendon Road) all the way (over Ring Road at lights) up to the High Street. Turn left and go past Wetherspoons (Moon under Water) on your right and then take the first right after 100 yards into Market Street. Continue along again crossing Ring Road to T junction & then left at an excellent chip shop. Vicarage Road is the next right turn. It should take around 15-20 minutes to walk.